The Society of Gloves: Album Art: "White Rhino"
This is the virtual "cover" for our equally virtual "single" called "White Rhino." It is essentially a modification of the old, public domain Rider-Waite tarot card called "The Hierophant." I personally thought this imagery to be very appropriate to the song. On the surface, yes, there are two mentions to a "hierophant" in the song, but I think the picture of a seemingly high-and-mighty, holier-than-thou priest sings volumes to a particular meaning to the song. As a songwriter, I'm hesitant to reveal what I think the song's about. It really doesn't matter what my interpretation is, as the listener should come up with a personal meaning, that is, if the song resonates personally in any way. This is the original tarot card, colored by a Wikipedia editor named "Bastique." Apparently, while Pamela Colman Smith's drawing is in the pubic domain, the card company US Games Company holds rights to their colorization of the card. Yes, they've copyrighted colors...how about that? 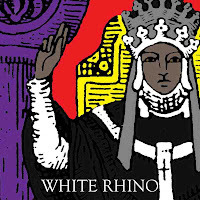 And this is the full "tarot card"/liner notes version of the "White Rhino" album art. The letters that form S. of G. and White Rhino come from other cards from the Rider-Waite deck. If guess if US Games Company can claim copyright to their particular set of colors, then the Society can claim this art remix as their own. Anyway, we want to give a big thanks to the original artist, Pamela Colman Smith, for the righteously creepy design.